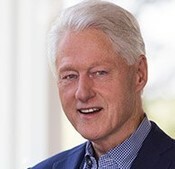 Bill Clinton was elected President of the United States in 1992, and he served until 2001. After leaving the White House, he established the Clinton Foundation, which helps improve global health, increase opportunity for girls and women, reduce childhood obesity and preventable diseases, create economic opportunity and growth, and address the effects of climate change. He is the author of a number of nonfiction works, including My Life, which was a #1 international bestseller.